WE’VE SPENT THE LAST FEW MONTHS diving deep into the world of San Antonio, and that’s taught us one thing: It truly is an entire world. This city isn’t like the rest of Texas — it’s not (only) cowboy hats, barbecue, and queso; it’s colorful markets, craft beer, and centuries of history. Really, it’s not like the rest of America, either — San Antonio is a mixture of Spanish, French, German, and indigenous influences, and that makes it not Southern. Not Western. It’s just…San Antonio. So if you’re ready for a look into a world of never-ending festivals, history as big as the Alamo, and margaritas served riverside — a world full of cathedrals, French architecture, and notes of Old Mexico — let’s get started. It's not up for debate: San Antonio is beautiful (especially at night). The combination of Spanish, Mexican, and French architecture—with a hefty dose of the modern thanks to decades of steady growth—makes for one exquisite city. This is the "Lady of Justice" fountain that stands in front of the Bexar County Courthouse, across the street from San Antonio's historic Main Plaza. In San Antonio, a warm welcome sometimes includes dozens of hanging piñatas. It may also come with unforgettable Huevos Al Gusto if you're at Mi Tierra Café y Panadería, in San Antonio's Market Square District. It's become a San Antonio staple largely for its food, but the ice cold beer, strolling musicians, and always-up Christmas lights certainly don't hurt. All other city rivers wish they could be like this one. Here you'll find pedestrian pathways that wind and loop along the water, past stone bridges, restaurants, and clubs, connecting you to places like the Alamo, the San Antonio Museum of Art, and the Pearl Brewery. You could spend days here checking out the shops and cafes, taking photos, or simply grabbing a bench and watching the lights dance on the water. All that beautiful San Antonio architecture requires a special vantage point, and there's none better than the top of the Tower of the Americas. It's 750 feet tall and was for a long time the tallest observation tower in the country. Fun fact: If you can run up its 952 steps in about 5 minutes, you'll take the record. But, yes, there's also an elevator. Find the tower in downtown's Hemisfair Park. It started with the Yanaguana people. Then it was the Spanish in the late 1600s. Then there was the building of the missions, the Battle of the Alamo (pictured above), and the rise of the Old West. When it comes to American history, it doesn't get much better than—or as plain to see as—in San Antonio. You know your annual state fair? This is like that—times infinity. Fiesta San Antonio is 11 days of live music, celebrations, food, parades, flowers, beer, and history—and it takes three million people for it to happen (attendees included, of course). If you haven't been, this is one event that needs to go on your list. Back in the day, exotic-themed theaters were all the rage. The Aztec was once part of an entire theater district that included the Empire, the Texas, the Majestic, and the Alameda. 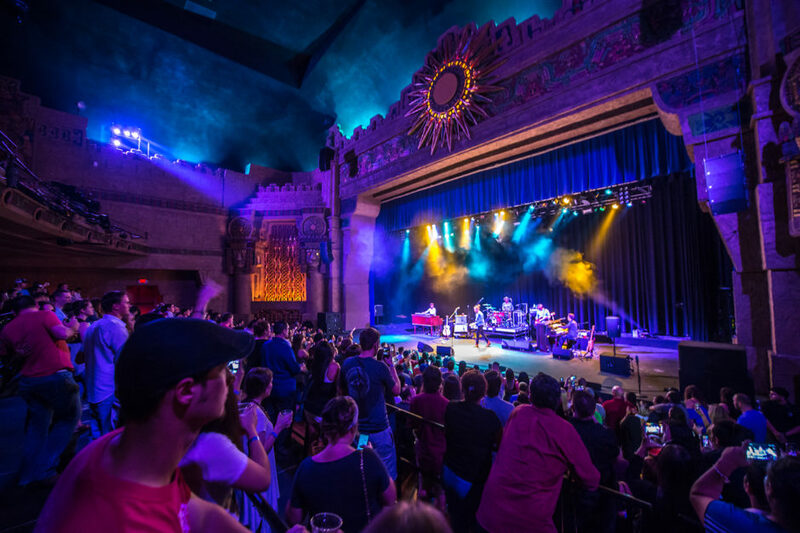 Now it sits comfortably on the National Register of Historic Places and is a pretty incredible modern music venue; in the coming months it hosts big-time acts like Lukas Graham, Kaleo, and Lauryn Hill. See more: The biggest party you've never heard of is going down in San Antonio. Meet Fiesta. Merely a hotel? Or classically composed cubism at its finest? You'll find all manner of incredible lodging options in and around downtown San Antonio and beyond. You know, just chillin' with the neighborhood hippopotamus. Clearly, this isn't just any zoo—there are large, walk-through exhibits like Africa Live!, Amazonia, and the Cat Grotto in addition to fun features like the one shown above. And with some 3,500 animals in residence, the zoo isn't just for kids—adults will be amazed, too. One of the oldest active cathedrals in the US is right here in San Antonio, the Cathedral of San Fernando. It was built between 1738 and 1750 and houses the tomb of Davy Crockett. It's always worth a stop, but try to schedule your visit to see The Saga—the entire facade of the cathedral lights up in brilliant colors for 24 minutes, telling the story of San Antonio from its beginnings to the present day. Tuesdays, Fridays, Saturdays, and Sundays at 9, 9:30, and 10pm is when the magic happens. It's not all history and Old World flair here—the craft beer scene is legit and hopping. One of the city's freshest is Freetail Brewing (named after the "Official Flying Mammal of Texas") and their signature brews like "Bat Outta Helles" and "Rye Wit." Get in on the action at the downtown tasting room Thursdays through Saturdays till 9pm, or hit the northside brewpub for seasonal brews like Piñata Protest. Alternatively, come to town for the San Antonio Beer Festival in mid-October and you'll get to try over 400 beers in one place. 25 blocks of history, aka the King William Historic District, are preserved along the river just south of downtown thanks to some serious foresight on the city's part. The neighborhood is full of elegant 19th-century German-inspired houses, many now turned into B&Bs, cafés, and art galleries. And that means you can do more than marvel from the outside. The River Walk is one of the most beautiful places to be in San Antonio any day of the year, but around the holidays it gets even better. There's the holiday river parade, boat caroling, and the Ford Fiesta De Las Luminarias all to check out starting in November. Explore the River Walk for long enough and you're bound to run into a few welcome surprises, like bluesy jazz tones sneaking out of doorways or the scent of grilling scallops catching a ride on the breeze. You can find this intimate dining space at Bella on the River; for some of the best live jazz in the Southwest, check out Jazz, TX at the Pearl—it's one of San Antonio's newest and most exciting venues. The oldest of the four missions of San Antonio Missions National Historical Park is Mission Espada, built in 1690. The missionaries wanted life and culture to resemble that of the Spanish villages they left behind, and they succeeded. Now we're left with remnants of the past—though the mission's aqueduct is still in use today. And the four missions plus the Alamo are now recognized as a UNESCO World Heritage Site. La Antorcha de la Amistad, or the "Torch of Friendship," stands in downtown San Antonio just south of the Alamo. It was a gift from Mexico in 2002, bestowing on the city 45 tons' worth of goodwill. The sculpture is lit up in different colors at different times of year, and from no two angles does it look the same. More photos like this and you're going to have to start picturing Texas in a different light. The 33 acres of the San Antonio Botanical Garden—full of ginger, daylilies, rose of Sharon, coral trees, butterfly bush, and angel trumpet—will make you wonder where exactly in the world you are. No need to book that flight to Mexico—those looking for a taste of quintessential "south of the border" will find it right here in Market Square. It's the largest Mexican market in the US, complete with authentic Talavera pottery, great panaderías, handcrafted art, and three blocks of Cinco de Mayo vibes. (Bonus: San Antonio's Cinco celebration is right here, too). The site where Davy Crockett defended the Alamo. The most famous River Walk in the country. Aztec-themed movie theaters, cathedrals, and "palaces." Does that sound like any other city? We wouldn't be doing our jobs if you didn't leave this gallery hungry, especially with the too-easy task of presenting San Antonio's unparalleled Tex-Mex cuisine—part traditional Mexican, part modern San Antonio. 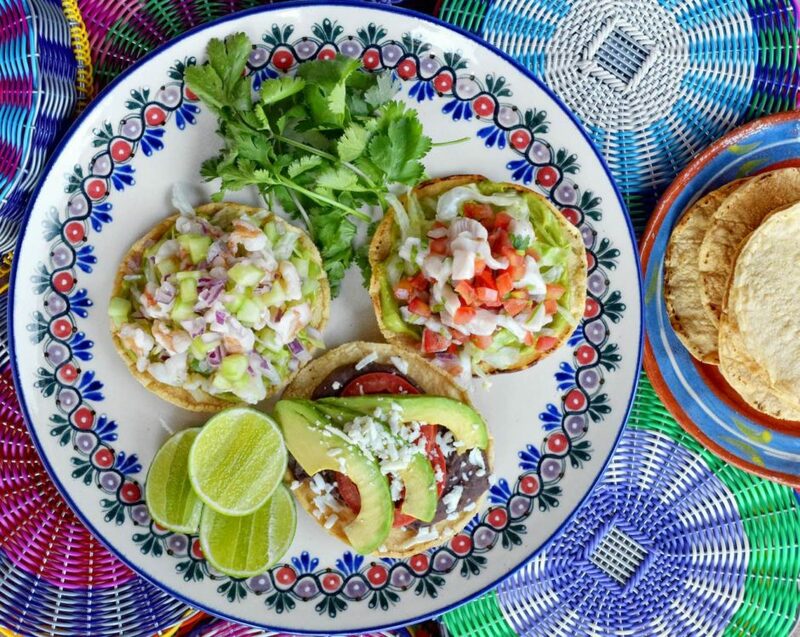 This dish in particular is from La Gloria (drool-worthy Mexican street foods like tortas and tlayudas, served cantina-style), but wherever you go when you're here, odds are you won't be hungry for long.